The key to delicious, flavorful sauteed spinach is to saute it, not stew it, which is what I've seen too many people do when they think they're sauteing it. Cook it quickly over very high heat, stirring very frequently so the liquid that cooks off evaporates more or less immediately, so the pan stays dry and the spinach leaves are cooking in dry heat, not wet heat. 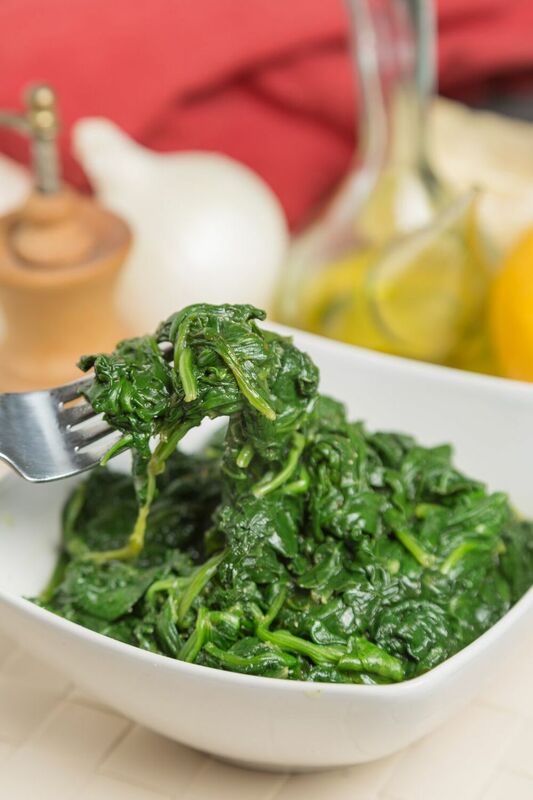 Too many bunches of spinach have been ruined by low temperatures that cause the delicate leaves to stew in their own liquid (which can be tasty, but doesn't result in the brighter flavor of sauteed spinach). See how easy it is to saute spinach below. This recipe is as much a method as a recipe, so increase amounts and add seasoning as you like, just make sure that you're always using a pan that large enough to hold the spinach in a very shallow layer. Work in batches, if necessary. Thoroughly clean the spinach and pick it over, discarding damaged leaves and thick stems. Heat a large frying pan, sauté pan, or pot (the key here is a wide surface area) over high heat. Once hot, add the butter and/or oil. It should melt and/or heat immediately. Quickly add the spinach and cook, stirring, until the spinach is wilted. The high heat and stirring will help any liquid the spinach releases evaporate quickly, which is what you want to avoid wet or slimy spinach when all is said and done. If you want to cook more spinach, add it in batches so that as the leaves wilt, the liquid they give off evaporates right away. Transfer the spinach to a serving platter or plates, and sprinkle with salt to taste. Serve hot or warm. A squirt of lemon isn't a bad addition if you're lucky enough to have fresh lemons around. Enjoy alone or with your favorite main course!